Experience Luxury Aboard Our 90′ Palmer Johnson Motor Yacht! If luxury cruising, snorkeling Rose Island’s shallow, magnificent reefs, lazing on the beach, racing on our new 2-person wave runner, scuba diving, deep sea fishing in total luxury and gourmet dining before, during and after all of these activities sounds good to you, then this luxury yacht is the yacht for you! This luxury yacht is an 84 ft. luxury cockpit motor yacht built by the respected Palmer Johnson yard in Sturgeon Bay, Wisconsin. She was repowered in 1997 and the interior was completely refit in 2001. 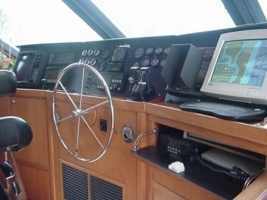 The yacht is air conditioned, of course, and sports a 42″ Plasma TV in the main salon with satellite service from Direct TV, complete electronics and navigation systems plus stabilizers for your safety and comfort. This luxury yacht carries a new 14 ft. Nautica Deluxe tender with a 60 hp Yamaha outboard and a new Yamaha GP 800R 2-person wave runner plus scuba gear with an onboard compressor and complete sets of snorkel equipment for your entertainment. Her Captain, Graham Barnes is an experienced diver with many years of experience navigating and diving in the Bahamas. Rachelle Roubique, this luxury yacht’s chef, prepares anything our guests prefer from gourmet formal dinners to typical Bahamian fare. 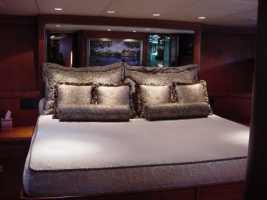 For overnight charters, this luxury yacht luxuriously sleeps 6 guests. 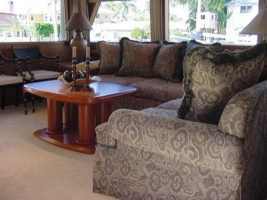 The sumptuous master suite has a California King Bed, walk-in closet, luxurious ensuite granite bath, TV, CD and DVD. The two guest staterooms have ensuite heads with granite counters and showers, two twin beds, CD players and ample storage space for personal belongings. Whether you enjoy lazing about on the fly bridge, reading in the shade of the aft deck, or sipping a tropical cocktail on the bow, this luxury yacht is designed to suit your needs. 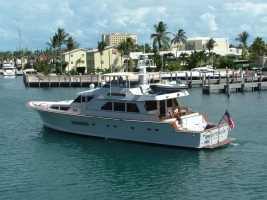 For the active, this luxury yacht is fully equipped with deep sea fishing gear. 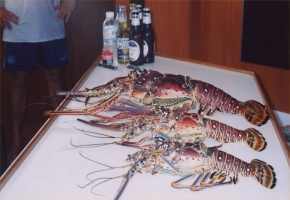 Typical catches are Blue Fin Tuna, Wahoo, Spanish Mackerel, Snapper, Pompano and Dolphin. Your catch can be filleted and served the same day it’s brought onboard. 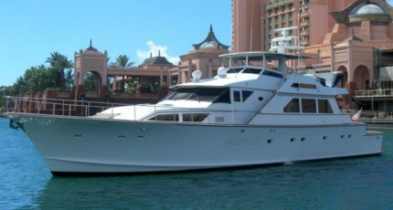 Currently berthed on Paradise, Island, Bahamas, and certified for charter by the Bahamian Port Authority, this luxury yacht is available for a simple 4 hour harbor cruise, a day to Rose Island, a 2-3 day trip to High Bourne Cay or Harbor Island, a week in the Abacos or for as long as you wish to any Bahamian out Island you choose. 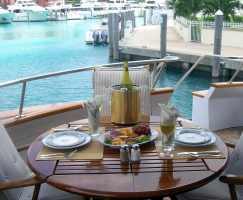 Day trips to Rose Island or Athol Island include a light continental breakfast, buffet style lunch, and afternoon snack with rum punch, beer, vodka, soda, and water for up to 10 guests. (Wine and Champagne are available upon request.) We request 24 hour notice to ensure that your dining requests are beyond expectations. 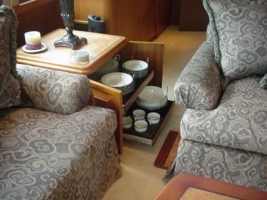 You will be provided with a preference sheet for weekly trips to ensure that your desired foods are on board. Weekly trips include three meals daily, hors d’oeuvres, & limited bar. Specialty food items, champagne and wine are available at market price.